Hey guys! 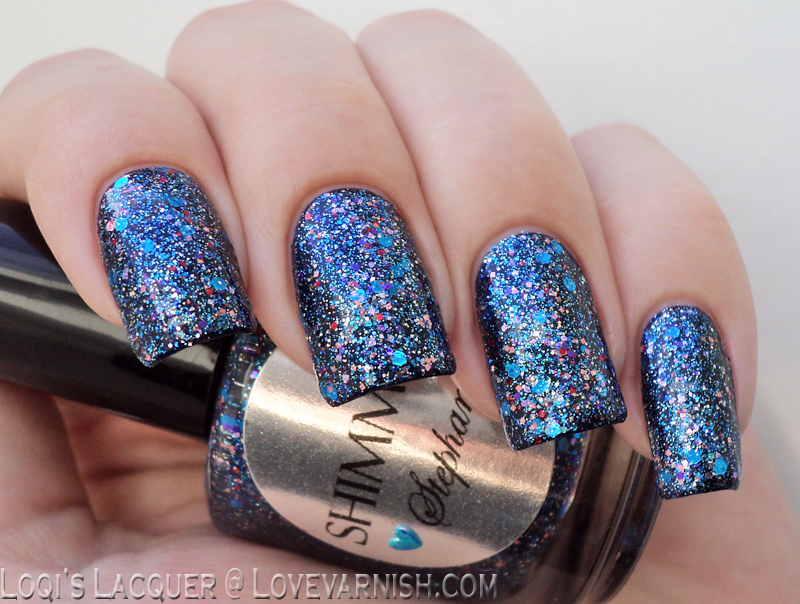 This is it, these are the last 2 Shimmer polishes I have to show you. And what beauties they are! First up is Stephanie, a beautiful blue mix with some red sparkle. 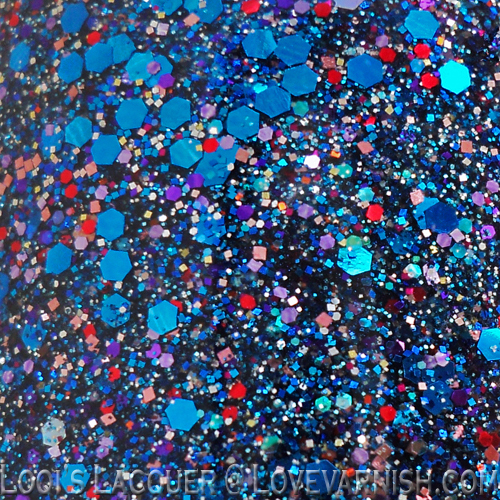 And second it Courtney, a very bright and happy multicolour mix with different sized glitter. 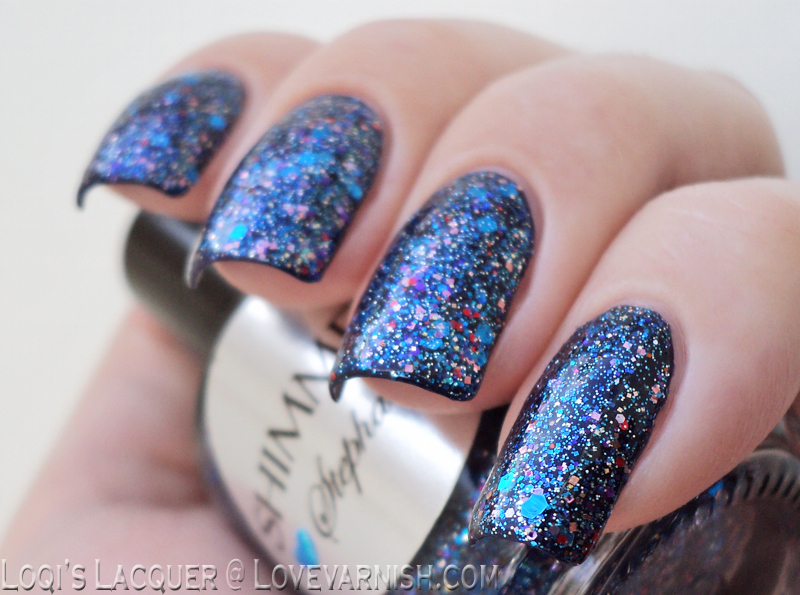 As I mentioned above, Stephanie is a gorgeous blue glitter mix. The polish has a clear base and is filled with different shades and sizes of blue glitter, small purple and pink glitter and medium red glitter. The red gives this polish a really interesting pop and I really love it because of this! For this manicure I layered 2 coats of Stephanie over a base of China Gaze Up all night and topped it of with a nice coat of topcoat. Courtney is a very bright and merry mix of all kinds of colours in a clear base. Because the red and gold are the most visible the polish looks kind of orange in the bottle. 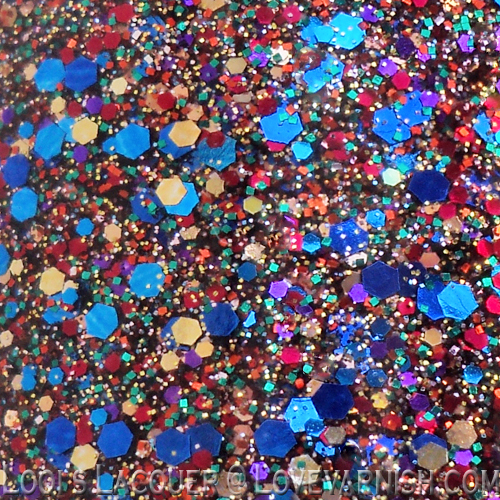 Besides gold and red there is also green, orange, fuchsia and purple and 2 shades of large blue glitter. I decided the best way to show you all the pretty colours was to layer Courney over black, and I really love how the combination turned out. This manicure is bright, but not over the top. So, even though these were the last Shimmer swatches I have for you, I am not completely finished yet. Because all these swatches have been spread out over such a long time I want to do a 'Shimmer Swatchathon Recap' for you, revisiting some shades and detailing al the pros and cons! So if you are interested in that please check back this Thursday! 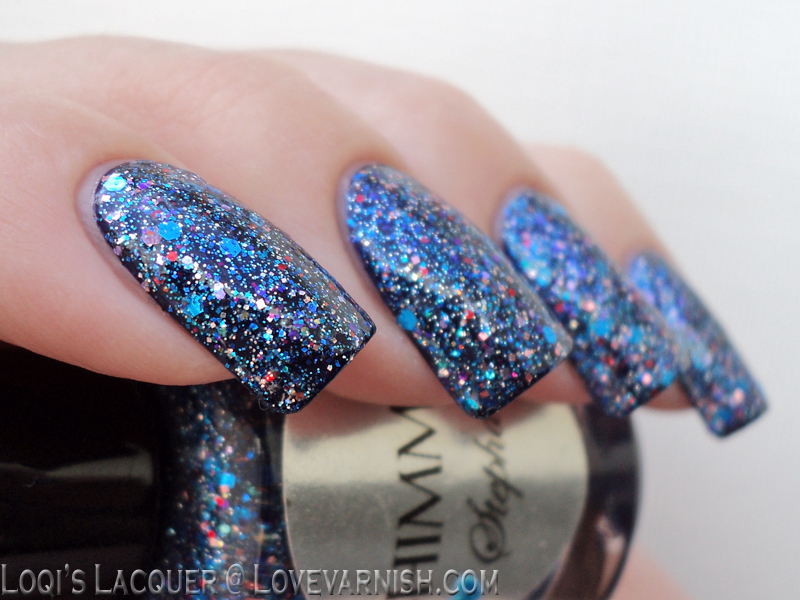 Wow, these are glitter awesome! So pretty. I'm loving Stephanie! These are so bright and so pretty. Great job! Very pretty, love those macro shots! So much glitter and so pretty!! Omigosh - your macro shots are seriously to die for. I love Courtney... I think they are both gorgeous... but I love Courtney. 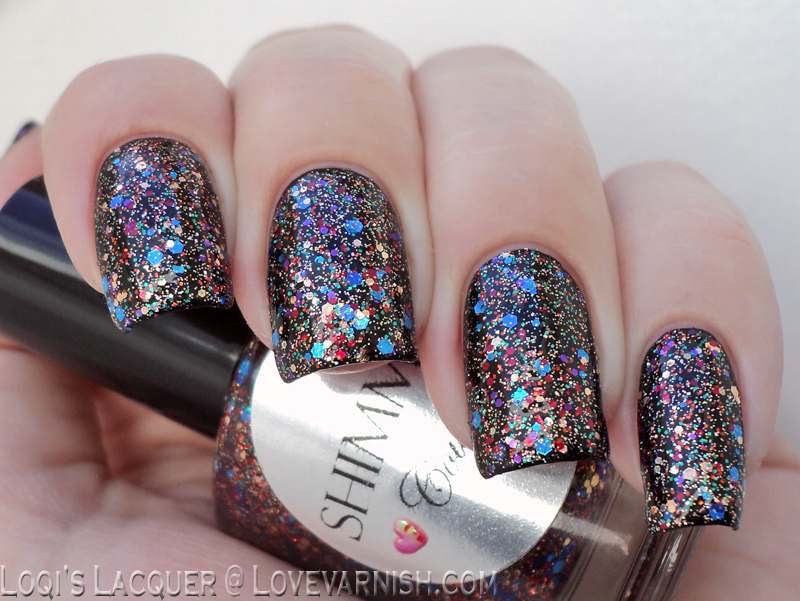 I love Shimmers-- I'm not a glitter gal but Shimmers are the exception. The mixes are so gorgeous and special! Beautiful photos-- you did these justice <3 And Courtney looks just beyond over black. These are so outstanding! They look great layered over black! How is it possible for so much gorgeous to exist on one page?! 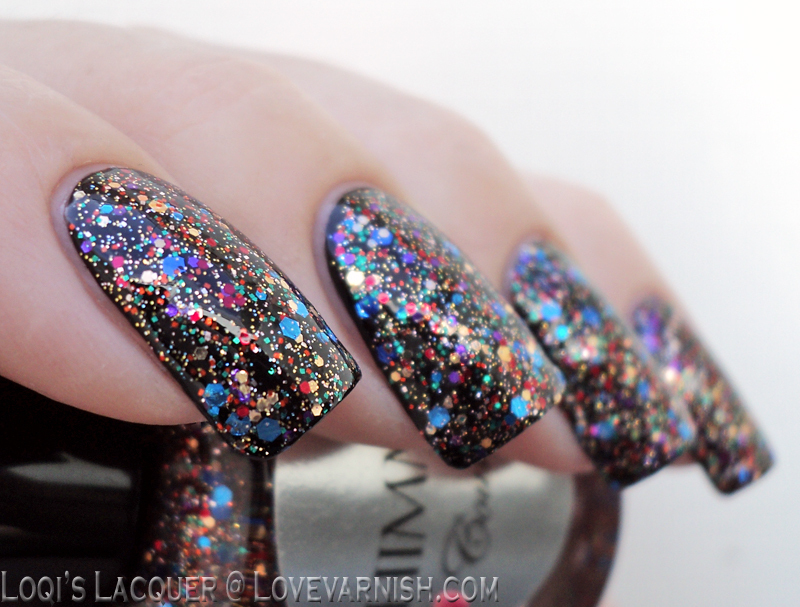 Gorgeous swatches, I love the complexity of Shimmer polishes. Stephanie is one of my favourites! :D Name polishes are great! I hope she likes this one! <3 you are making me blush, thank you! Yes! Such a happy polish! Thank you :) me too! 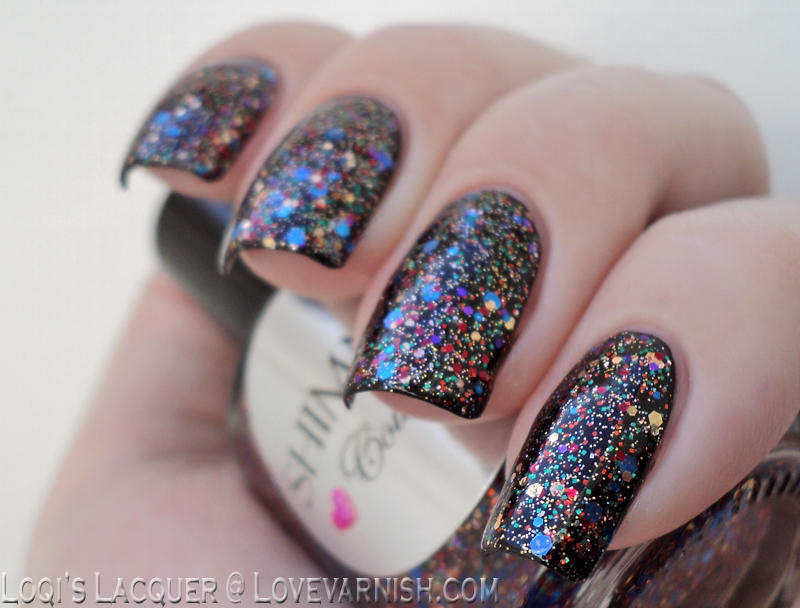 A lot of the time glitter polish can be quite dull, especially when the light doesn't make them sparkle. Shimmer polishes are always interesting, even in less ideal light. I love Stephanie! It's so vibrant! Great swatches Loqi! wow! Both of these look gorgeous! These are both amazing! :) thank you. Thanks! I am very glad you like it!